Another day, another long bike ride to Florida’s American Top Team gym. Another night on the mats, another night hitting mitts, another early night in bed and another early morning for training. Charles Rosa is a long way from home. The Boston Massachusetts native left his hometown for Florida to escape his demons, addiction, and the crippling loss of his two brothers. His journey is one that many of us will never be able to comprehend, and never want to. While he was looking for a fresh start and a new outlook, he stumbled on something he didn’t quite expect, a new path for life. Many champions have walked the path, and it’s a hard one. It’s littered on all sides with missed meals, early mornings, and plenty of blood, sweat and tears. It’s full of the bones of the men not ready to take the trip, not willing to sacrifice, not willing to push on when it hurt the most. But for Rosa? He’s seen too much to quit, he’s been too far to go back. Charles Rosa’s bike-ride to work transformed into a quest for gold. In the city of Boston, the boys are built tough, but they don’t build them tougher than Rosa. 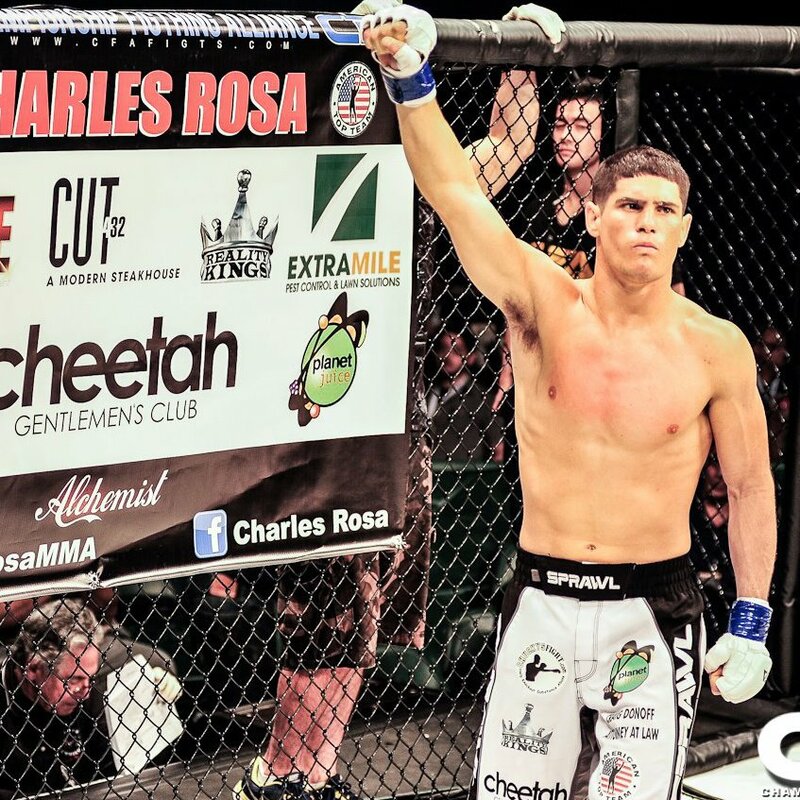 As he prepares for his homecoming, a battle against Jimmy Hettes in the legendary “Boston Gah-din” on January 17th, Charles Rosa exemplifies a fighter’s heart, and why wouldn’t he? He’s been fighting all his life. Living in Boston, playing hockey, and a member of a fighting family, Rosa grew up tough and from an early age showed exceptional promise as an athlete. Several of Rosa’s uncles were amateur boxing champions, his father a black-belt in his own right, and his grandfather a boxing champion himself, with Charles eventually playing college hockey in the ultra-competitive New England hockey scene. His cousin, Lewis Corapi, is currently a top-ranked professional fighter in New England’s top promotion, as well. I guess you can say that Rosa was almost bred to be a fighter, but it’s an intense work ethic and drive to succeed that’s provided the winning recipe for the young Bostonian’s career so far. That…and the fact that the kid is really really fun to watch. As game as they come, and continuing the Boston MMA tradition of finishing fights by any means possible, Rosa has garnered two fight of the night awards in three UFC appearances, and has finished all 10 of his victories before the final bell, 8 in the first round. As a fighter, Rosa is hard to dislike. Outrageously tough, Charles has proven able to finish any opponents with his hands, shins or knees, training all over the world in striking, specifically Holland to hone his skills in kickboxing and muay thai. His submission game is ferocious, the American Top Team product has scored every submission under the sun at some point in his amateur and professional career, tapping 7 of his 10 opponents and knocking out the remaining 3. Peruvian neckties, arm-bars, leg-locks, triangles, Rosa flows from submission to submission with an intense aggression, always searching for the smallest opening to take someone out. He can take a punch, as well as give a hell of a punch, and apparently has never heard of the word “backwards”. Rosa is all action, all pressure, and full steam ahead, meaning any time he steps in the cage, the result is usually fireworks. He’s also, simply put, a great guy. His father’s charity, Chucky’s Fight, is a New Hampshire based charity dedicated to “knocking out substance abuse”, a subject that the Rosa family is sadly, too familiar with. Rosa’s brothers Vincent and Dominic both passed away as a result of overdoses, and Charles himself has struggled in the past after losing his siblings, until changing his life through the martial arts. He stops by children’s hospitals, sends positive messages to the youth, and is nothing but smiles outside of the cage. Rosa and his family today actively campaign at schools, social gatherings and community events to spread the message about addiction for young men and women, and hope that the story of their sons, Vincent and Domenic, can save lives though their example…and that their son Charles can give hope to people struggling though sobriety with his. A true ambassador to a sport that is constantly stereotyped by tribal tattoos and mean personalities, the UFC could have something truly special in the philanthropy of one of their youngest stars. Like I said, Boston has a reputation being tough, and all of its fighters follow suit. From Marciano to Mickey Ward, Lauzon to Florian, Marvin Hagler to Jorge Rivera, Charles Rosa now stands among a fraternity based on blood and tradition. Rosa has thrown his hat into the ring as a kid with the potential to be the next big thing, and the toughest city in the world behind him. For Boston’s newest fighting son, the future is bright, and all he sees is gold. Also don’t forget to actually support Chucky’s Fight, and help knockout substance abuse!